Bus Boy Servicing will educate you on how to clear tables, take the dirty dishes into the dishwasher, set the table and provide assistance to the waiting staff. This courseware has 4 modules related to bussing and housekeeping. Module 1: Will introduce you to the Food and Beverage Service. It will also teach you the entire flow of service starting from the dining room until the kitchen. Lesson 1: Introduction to Food and Beverage. Lesson 2: The Flow of Service from Dining Room to Kitchen. Module 2: Will then focus on the identification of tools and equipment used when dining. You will know the tools commonly used by waiters that are found in restaurants and other related industry. Lesson 1: Identifying dining tools and equipment and their usage. Module 3: Proper way of Clearing/Bussing out soiled Dishes. Now that you’ve known the tools and equipment that you will encounter every day, you now need to know the right way of clearing or bussing out those soiled dishes. Module 3 will guide you along the way. Lesson 1: 3s in Bussing. Lesson 2: Proper way of cleaning soiled dishes. Module 4: 5 S of Housekeeping. Now is the time to learn the 5 S of Housekeeping. Module 4 will discuss the characteristics of a good housekeeper. Lesson 1: Sort, Systemized, Sweep, Standardized, and Self-Discipline. 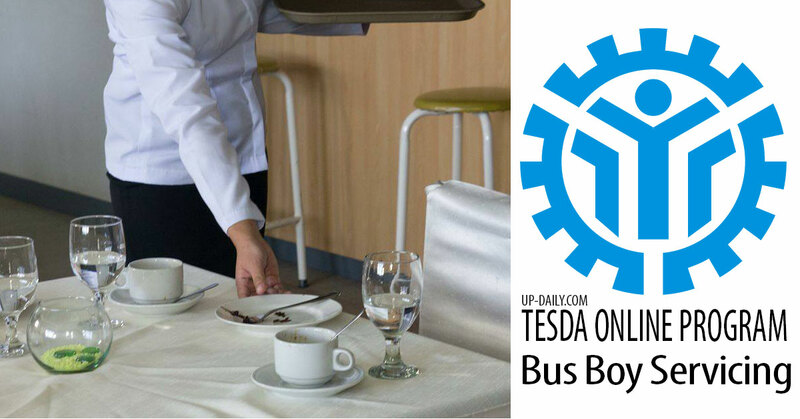 Note: Tesda Online Program does not issue any training certificate of completion. If you are aiming to have a National Certificate (NC) in Bus Boy Servicing, you may go to the nearest Assesment Center and take the national Assessment. At the end of this courseware, you will know all things related to housekeeping and bussing out. Since this will be the last requirement for the completion of Food and Beverage NC II, you can now take the National Assessment so you can have the National Certificate in Food and Beverage Servicing NC II.